As of September this year, SwipeGuide, a StarterSquad project, entered the Pressure Cooker program at Startup Incubator UtrechtInc in the Netherlands. SwipeGuide is a platform that enables you to create, share and use visual step-by-step instructions on mobile devices. You can check out www.swipeguide.co to learn more about the startup. In this blogpost, I will focus on our first two months at UtrechtInc. And yes, as the title suggests, there is more to come …. UtrechtInc’s Pressure Cooker program is a 4-month program that helps startups validate their idea and create a solid foundation for success. The program is rooted in Lean Startup and Customer Development principles and focuses on healthcare, education and energy startups. To enter the program, we had to go through a selection process consisting of an application, pitching and Q&A sessions. With some sweat and tears, SwipeGuide was selected as one of the program’s 8 startups from over 50 applications. It seems that internet startups are hot when you look at the number of applications submitted to this and other Incubator programs. In the case of UtrechtInc, startups are selected according to three factors: team, business model and go-to-market approach. Another interesting fact is that the existing community of UtrechtInc entrepreneurs has an important role in the selection of new startups. Of course we were delighted to hear that SwipeGuide was accepted into the 4-month program. On a personal note, I am thrilled to be able to apply these principles once more. Although StarterSquad embraced the ideas of Eric Ries and Steve Blank quite some time ago as guiding principles, every case we work on brings us new knowledge and insight. I have set-up startups before and am a believer of Lean and Customer Development. But I must say I never followed the principles as strictly as the Pressure Program demands. This enabled me to learn what works and what doesn’t for me as an entrepreneur. Founders dream: What is the dream you are pursuing with your startup? For the World, for your Customers, for yourself? Working in a Startup: What makes a team effective? What roles do you have in your team? What are your ways of working (like Agile development & SCRUM)? Finding the customer need or pain: What is the deal you offer? Who do you offer this for? What are the needs and pains that you have a solution for? Developing a value proposition: How do you get to the right value proposition? Business modeling: Lean Startup Learning Cycles, Customer Discovery. Revenue models: How do you make money with your startup? The kick-off week ended with mentor matchmaking and the development of a roadmap for the coming 4 months of the program. We already were able to test some of our assumptions in the kick-off weeks. This has lead to some first iterations of our business model. SwipeGuide as a product was clear to a large extent, but finding the customer segment with the biggest pain and sufficient budget was the first challenge we took on. We moved from B2C + B2B to a B2B focus and discussed markets from consumer products to healthcare. In the end, we decided to take the needs-based segmentation approach described by Clayton Christensen in the Innovator’s Solution. Looking at the target customer from a different angle helped. The market you focus on first is called the beachhead market based upon the Disciplined Entrepreneurship approach of Bill Aulet. Even from the needs angle this remained a struggle, since the product offers value in several ways. For now, we decided to explore some markets in parallel. The process of setting and testing hypothesis feels like a scientific approach to entrepreneurship. In that sense, Lean & Customer Development are about micromanaging the entrepreneurial process. For me it felt a bit counter intuitive at the start, but it proved to have some value in the process. As an opportunistic guy, I tend to just start and find out on the go. The program forced me to act counterintuitively, with some good learnings as a result. The proof you get from customers is absolutely valuable and manages the risk of building the wrong things (“no idea survives first customer contact”). On the other hand, I also like the less structured and more creative and opportunistic proceeding of startup ideas. We found out some interesting things during the first 2 months that confirm Customer Development is useful with the Mom test as our first entry point. A Mom test is all about asking the right questions to your prospective customers. It is rooted in the idea that if you ask your Mom if your startup is a good idea, she probably says YES just to support you. But of course, when money is involved you want to have a real answer. We started aiming at building mobile instruction tools for service engineers in (high)tech environments. But, based upon our first Customer Discovery sessions we found that service engineers in cleanrooms are not allowed to use mobile devices. The engineers at a gas company already got their work instructions for every job from SAP, so there was not enough pain to justify our new product. In some other cases, people had no access to mobile devices anyway, so we ended up with a lot of answers that changed our view on customer needs and pain. At a certain point, we even reconsidered asking our moms if our startup was a good idea to finally get some confirmation. While talking to the other startups in the program, we found that although we have things in common, our differences are huge. We had B2C versus B2B, products versus services, ideas versus startups with clients. Also on the team level, the knowledge, skills and team formation differs strongly. It is great to see how these differences will lead to different results during the program and I will try to keep you updated on the causal relationships that we might find. The team is critical in a startup. We started out as a team of two, with me in the founder role and a developer helping out in platform development. It was almost a fail for qualification into the program. UtrechtInc indicated that this is not a very solid basis, since you need more execution power and specific skills on board. Last week, I went to a Founder Dating event at UtrechtInc and met some interesting people. I also used other matchmaking platforms and looked for someone that can join the team as a co-founder. Someone with skills that are complementary and with access to a potential distribution channel / network for SwipeGuide. The coming weeks are critical for SwipeGuide. We aim at making progress in both validating our idea, establishing a team and developing a minimum viable product. We’ll keep you posted on our progress and learning. In case you have any questions, don’t hesitate to contact me at daan@swipeguide.co. This post originally appeared on the blog of Startersquad and UtrechtInc. Guest blog by Daan Assen, founder of Atrivision and co-founder of Swipeguide. Since 1999 Daan has been involved in the launch of several Startups. He has a background in Business Administration (TiasNimbas Business School) and Marketing (Harvard Business School). Specialized in Business Model Innovation, Lean Startup & Customer Development. 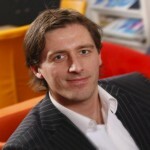 Daan is lecturer Entrepreneurship & Innovation at TSM Business School.